We have a vote coming up! The hospital has agreed to increase the night shift differential to $5.00. We will be voting on the MOU Thursday, Aug. 30. Time to be determined. The vote will be at the hospital. The meeting is scheduled for Aug. 21 at 4 p.m. in the ABC room. All nurses are invited. At this meeting we discuss contractual issues. This form is your documentation for staffing issues, lack of training in the department you are assigned, equipment failure, etc. After you fill it out, keep a copy for yourself, give a copy to Katrina, your grievance officer, and a copy for management. Katrina will give me a copy unless you want to email it directly to me at cgarrison@wsna.org. ADOs are addressed in Conference Committee. You can download a form here. 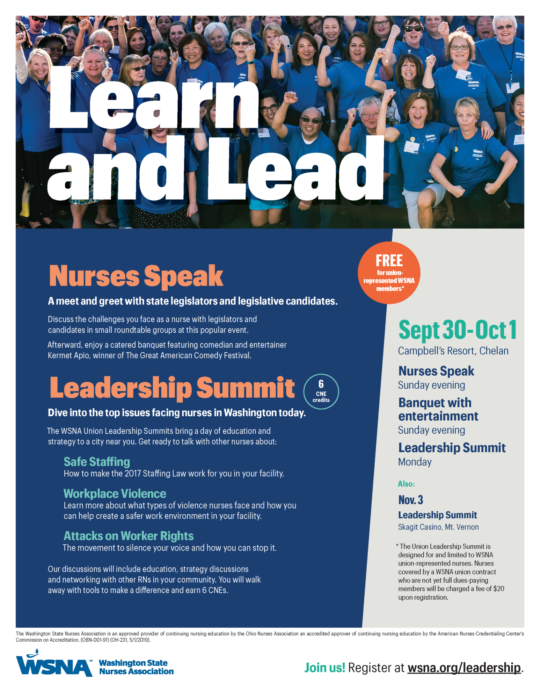 Nurses Speak and Leadership Summit is in Chelan from Sept. 30-Oct.1. This is a great opportunity to get free CEs. You can also use your Local Unit funds to pay for travel, meals and lodging. This year we have a fantastic comedian, Kermet Apio, who is going to entertain us on Sept. 30 during the dinner program. Register now for this great opportunity! Download our Chelan leadership flyer! Networking social on Sunday, 6-8:30 p.m. and CNE on Monday, 9 a.m.-4 p.m.
Networking social on Sunday, 6–8:30 p.m. and CNE on Monday, 9 a.m.–4 p.m.
All nurses are encouraged to register now for the WSNA Union Leadership Summit in Chelan. Members can use Local Unit funds to pay for travel expenses. Don't miss the upcoming Washington State Nurses Convention May 3-5! At Convention, we’ll be diving deep into one the top issues for registered nurses today: Creating a Culture of Safety. Register today for early bird pricing and hotel discounts (through March 30). Some local units are sponsoring attendance at Convention. Check with your local unit officers. In our recent contract negotiations both CMC management and WSNA committed to meet quarterly to discuss matters relating to issues that may arise over application or interpretation of our Agreement and to consider suggestions for improvements to quality patient care or other matters of mutual concern. Information about Conference Committee can be found in article 5.4 of your current contract. The bargaining this year was a refreshing mutually collaborative process. Your Bargaining Team brought the substantive issues to the table and management engaged in a way that enabled us to bring you a contract that is will substantially enhance your wages and better your working conditions. Your Team recommends a “YES” vote. The vote will be held on Friday, Dec. 16th from 1500-1800 at the Arleen Blackburn Conference Room. A summary of the contract changes will be provided. If you have any questions, please feel free to contact Carmen Garrison at cgarrison@wsna.org or 206-491-9424. We have reached an agreement with management. We will send out notification of the date, time, and location of the vote. Remember to thank your negotiating team, Annette Davis, Katrina Rostedt, and Deborah Jahnke for their hard work and dedication on behalf of you. We have met with management for three (3) sessions. Our next session is scheduled for September 29, 2016. We are looking at more dates, in case we need them but we are hopeful to have another productive day at the table with management and getting closer to an agreement. WSNA and management have provided proposals. We have had very good conversations regarding wages, hours, and working conditions. We will provide you with another update following our fourth session on September 29 as well as future scheduled dates. Please thank your hard working negotiating team: Deborah Jahnke, Annette Davis, and Katrina Rostedt. They have sacrificed their time and are working very hard to get a fair contract for all of you. If you have any questions, feel free to contact your WSNA Nurse Representative Carmen Garrison (cgarrison@wsna.org). The current contract between WSNA and CCH management expires September 31, 2016. This survey is our first step in preparing for contract negotiations. Your input is critical for determining our priorities as we head to the bargaining table. It is vital that we know your issues and concerns prior to the start of the negotiations. Take a moment to complete this survey now. The power of representation comes from the willingness of Registered Nurses to unite; our strength is in unity! Remember in order for WSNA to be an effective, strong, influential voice for you at the negotiation table, we need your membership and involvement. Please complete this online survey by August 5, 2016. Please help me find some dates that you are also available to meet with management. There have been a lot of changes going on lately with the staffing matrix and schedules. I would like to get something scheduled as soon as possible. Please go to the following link and fill out the doodle poll. I have picked a lot of dates and times because I would like to offer management more than one date to meet. Please click on every date and time that would work for you. I need the input as soon as possible, so please take a few minutes now to complete the poll. If you have any questions, please feel free to contact your Nurse Representative Carmen Garrison at cgarrison@wsna.org. Calling All RNs in Central Washington: Join us for Free Continuing Education! Advocating for a Healthy Lifestyle: Stress Management for Nurses on the Go! What does that mean in my job? Light dinner will be provided. Please give your Name, Home Email Address and tell us which class you’d like to attend: Stress Management, Right to Work or Both! Congratulations and thank you for volunteering to represent your fellow nurses at Cascade Medical Center. If you have any questions or concerns about issues, feel free to contact your Local Unit Representatives. You can also contact your WSNA Nurse Representative Carmen Garrison at cgarrison@wsna.org.